At the outset of each fall semester, the university hosts Freshman Convocation for incoming first-time-in-college students. This event is designed to underscore the transition that is taking place in the students’ lives and extend the support of the university community to its newest members. The guest speaker is always the current Distinguished Teacher of the Year. 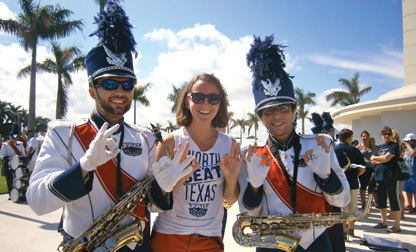 During the fall and spring semesters, newly arrived students are introduced to life at FAU via WOW – Weeks of Welcome. 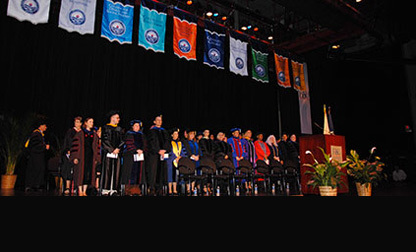 Activities include social gatherings, seminars and an overview of the wide range of services that are available to FAU students. The beginning of the fall semester also features Move-in Day on the Boca Raton and Jupiter campuses, when members of the university community turn out in large numbers to meet newcomers and help them move into student residence facilities. 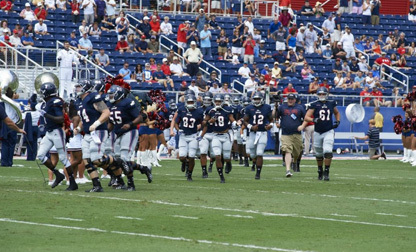 Every fall the FAU community joins in celebrating Homecoming Week. Homecoming events take place on all campuses and include kick-off festivities at FAU Stadium, a concert and comedy show headlined by nationally known performers, the ExtravaCANza canned food sculpture contest, a 5K fun run and, of course, the Homecoming football game, with the crowning of the King and Queen during halftime. The big Homecoming event on the Jupiter campus is CarnivOWL, while the Davie and Fort Lauderdale campuses celebrate with FAU Spirit Days. Always scheduled to coincide with Homecoming, Fall Family Fest is an eagerly anticipated afternoon of fun for people of all ages. Activities include carnival games, bounce houses, face painting, balloon art, photo booths, sand art, caricature artists, circus performers and more. 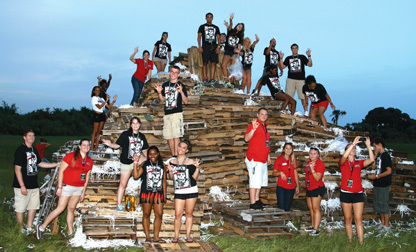 The annual fall bonfire, sponsored by Student Government Program Board with the assistance of the Student Alumni Association and other University partners, is quite literally the hottest tradition at FAU. Flames, smoke, music and excitement fill the air as thousands of FAU fans cheer the start of a new football season. Go Owls! The Taylor Victory Bell rings out the good news after every home win by an FAU team. Donated in 2010 by longtime FAU supporters Robert “Crash” Taylor ’75, and his wife, Nina, the Taylor Victory Bell is 60-plus pounds of solid brass spirit! Say what? Newcomers to FAU are often amused to find out that Boca Raton means “mouth of the rat” in Spanish. (The words actually mean “mouth of the mouse,” but local legend has had it as “rat” for so long that the erroneous translation has stuck.) 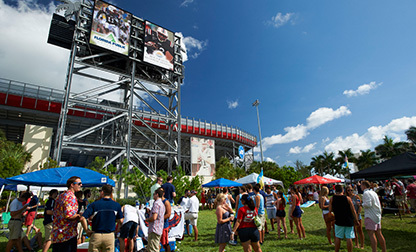 In any event, the term “rat’s mouth” has been embraced by FAU students, who have given that name to their favorite tailgating spot on the south lawn of the stadium. Come one, come all to Rat’s Mouth and get ready to cheer the Owls to victory! Another great football tradition is the Owl Walk – a human tunnel formed by students, the Marching Owls and the Cheer and Dance Teams that provides a very special way for the team to enter the stadium. This is the hand sign that’s flashed throughout the stadium when the Owls score a touchdown. Notable people who have made “Owl Fingers” include President Barack Obama during his 2012 visit to the Boca Raton campus and Washington Redskins running back Alfred Morris, who often flashed the sign during nationally televised games to show his pride in being an FAU alumnus. Owlsley, FAU’s high-spirited mascot, appears at all football games and many other campus events. A statue erected in his honor – a gift from the Classes of 2008, 2009, 2010 and 2011 – stands just outside the Recreation and Fitness Center. Students often rub his beak for luck before exams and competitive events. Among the returning FAU alumni who have posed for a photo with Owlsley is Scott “Carrot Top” Thompson, a 1989 graduate of the College of Business who went on to become a well-known comedian. 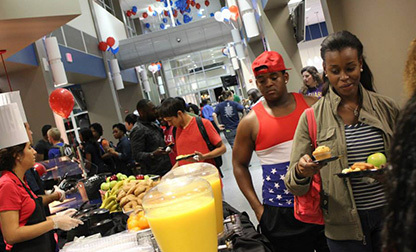 Free late-night breakfasts, which include music and entertainment, are presented on the Boca Raton and Jupiter campuses as finals approach, with faculty and staff serving as waiters. The purpose is to help students relax and have some fun before burning the midnight oil to pass their exams. When FAU’s biggest athletics rival, Florida International University, comes to FAU Arena – otherwise known as the Burrow – for some basketball action, fans decked out in “FAU red” turn out en masse. 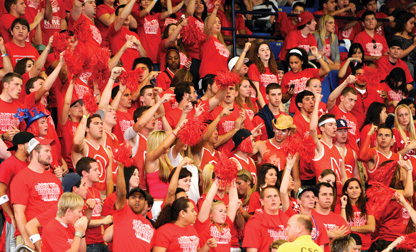 The motto of the day is Wear Red and Be Loud to help make the game a slam dunk for the Owls! Ker-splash! What sounds more juicy than a ripe pumpkin hitting the pavement from more than four stories up? 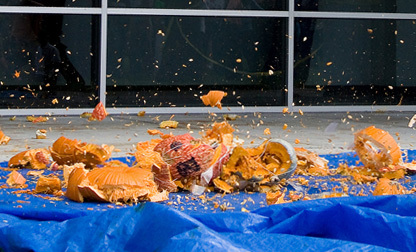 This exercise in splatology takes place at FAU every fall as professors toss pumpkins from the roof of the Charles E. Schmidt College of Science building to provide memorable demonstrations of certain fundamental principles of physics. Faculty members and students in the roles of Aristotle, Galileo, Sir Isaac Newton and Albert Einstein are on hand to explain the operative laws. Onlookers always include elementary school children, who get the idea that science can be fun. The Pumpkin Drop is followed by a Physics Carnival, with games that include rocket ring and pumpkin ping pong tosses, sticky darts and an Einstein bean bag throw. 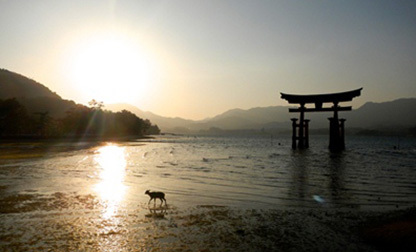 Every year many FAU students take advantage of the university’s Study Abroad Programs, traveling to locations all over the world. They’re encouraged to record their experiences photographically, and when they return to FAU selected images are put on display in a special annual exhibition. FAU MATH DAYS is a series of outreach programs, interactive activities, and events hosted by the Department of Mathematical Sciences designed to provide elementary, middle and high school students with a wonderful set of experiences that will inspire and motivate students to pursue further study and possible careers in Mathematics and Science. 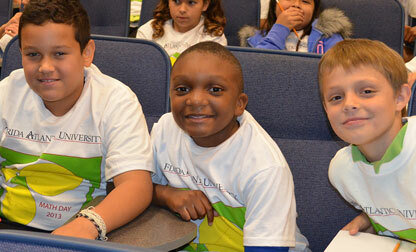 The events provide an opportunity for our community to visit campus and imagine themselves as future FAU Owls.